Selby invites you to the launch of high-end French speaker brand "Triangle"
French high-end speaker manufacturer Triangle have been designing and assembling speakers for over 35 years. Known for their precision and craftsmanship, Triangle select materials of the highest quality to ensure a distinctive musicality. Selby Acoustics are excited to be adding the Triangle brand into our range, including the Elara, Esprit, Signature models and Thetis & Tales subwoofers to compliment these models. "Selby Acoustics has established itself in the Australian market thanks to our relentless dedication to customer service and communication. With customers traveling across Melbourne to our Hallam store, we realised the demand for another outlet to better serve Melbourne's inner suburbs. With that in mind, we are excited to announce our expansion with a third retail store, in Thornbury Victoria on 3rd July 2018. Taking over the previous Hitek Audio Visual location, the Thornbury store at 594 High Street will see much of the Selby range available over the next few weeks. Hitek Audio Visual will be closing down on Saturday 30th June, and Selby will open on the Tuesday. Got a Budding Musician or YouTube Star in the Family? 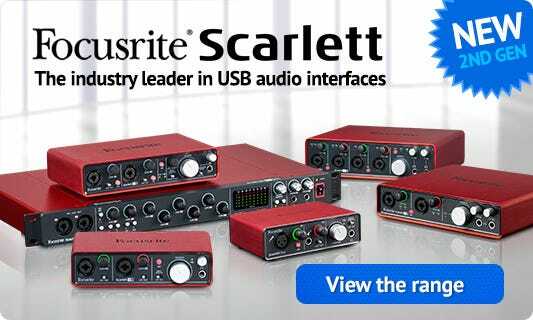 Focusrite's new 2nd-generation "Scarlett" USB audio interfaces let you record and playback audio from input devices (microphones, musical instruments etc) directly to your PC or Mac, which will dramatically improve your sound quality to the same level as a professional recording studio.